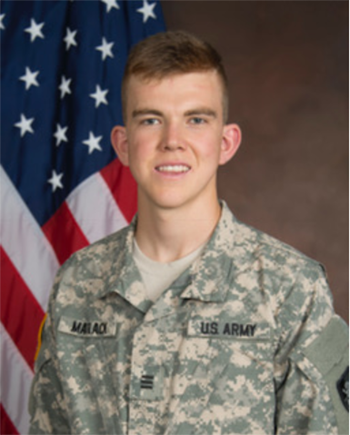 Seamus Matlack, who will graduated from the United States Military Academy in May 2018, was chosen to represent District 7930 as the 2018-2019 Global Scholar in the Rotary Foundation’s Area of Focus of Peace and Conflict Resolution. Seamus, a native of Boston, will pursue a Master’s of Science Degree in Defense, Diplomacy and Development at Durham University in England. In addition to his outstanding academic record, Seamus has had on the ground experience in Dushanbe, Tajikistan, where he worked with refugees from Afghanistan and Iran and co-taught a debate class. Because of his knowledge of Farsi, he was able to converse with village elders and community leaders who rarely have an opportunity to interact directly with English speaking Westerners. The Durham University Master’s Program provides specific expertise in conflict prevention and sustainable peace, conflict intervention, and post conflict reconstruction as well as diplomacy and peace building. The thrust of this Master’s program is how to include and incorporate diverse members of local communities into peace keeping operations. The US Army has recognized the need to be conflict resolvers and peace builders while being soldiers. Anti-terrorist campaigns are now based on working within communities rather battle tactics. The program allowing West Point graduates to pursue a Master’s Degree between graduation and military service is relatively new. Seamus, with his expertise in conflict prevention and resolution, will be in the vanguard of this peace initiative.